The Autism debate and the possible causes of autism are an ongoing debate amongst parents, doctors, teachers, psychologists and virtually everyone involved in the lives of children. From vaccinations to genetics, no one truly knows what causes autism. 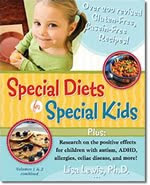 What many have figured out, however, is a way to improve the lives of autistic children through managing their diets. After beginning a gluten and casein free diet, most Autistic children show significant improvement. Their behavior improves, their emotions are more evident, they are more open to being social with other children and their eating habits improve. Why does a gluten free and casein free diet help autistic children? According to Bruce Semon, M.D., Ph. D, the gluten and casein free diet for autistic children is derived from the role that the proteins left over from digestion of those foods leaves in the body. The protein in milk and dairy products is casein while the protein in wheat products is called gluten. The structures of these proteins are what make it difficult for the body to process. They remain in the body long after food is digested and react with receptors in the brain called opioid receptors. Dr Bruce Sermon states that these receptors are what keep the brain functioning normally. When the proteins in casein and gluten bind themselves to these opioids, they slow the brain down as would opiate drugs such as opiates. Dr Sermon states that studies of the brains of most autistic children show that their brain is less active and has decreased blood flow, specifically in the areas that control speech. Adding gluten and casein further slows them down and does not allow autism to improve. This has, in turn, led to many parents, doctors and therapists to eliminate gluten and casein from the diets of autistic children. Many parents cannot fathom eliminating milk from a child's diet. That seems to be the stable in most children's diets and something they need to grow and develop. Breads, crackers, cereals and other carbohydrate laden snacks are also some of the favorite items of most children. Both, however, can be eliminated and substituted in a diet. Parents should begin by eliminating dairy products and casein. After a child has adjusted, they can begin to minimize foods containing gluten and eventually eliminate them. Gluten free diets are becoming ever more popular and many grocery store chains carry a wide variety of gluten free foods. There are gluten free pastas, soups, cereals, desserts and much more. As far as dairy products are concerned, soy is a good option but there are also many other options of butters, cheeses, almond milk, rice milk and even chocolate that are dairy free! The Gluten Free Mom offers a site to help parents in their quest to eliminate gluten and casein from a child's diet. She offers recipes, substitutions, options for dining out and much more. Dr Bruce Semon uses one of his patients, Carl, as one of the best examples of how gluten and casein free diets can help minimize or diminish autism. Carl went to see Dr Semon at the age of 2 and a half. He had stopped speaking at 18 months, was having seizures and was on medication in addition to behavioral therapy by the age of 3 years old. His mom had tried homeopathic drugs and, along with therapy, his symptoms showed slight improvement, however, changes were minimal and Carl was still not able to function in a regular classroom at school. Once the casein and gluten free diet was begun, Carl showed almost immediate improvement. Dr Bruce Semon stated that Carl was talking more, responding to questions and his name, was more spontaneous, was eating better, played appropriately and was showing general child behavior. Six months later, Carl was off any medications, greeted others and seemed less withdrawn and could even read and write! A year after treatment with a casein and gluten free diet began, Carl was in a full day kindergarten class and by the time he turned 8 years old, he was no longer diagnosed as autistic. In this case, the diet eliminated the autism all together! The Autistic Network for Dietary Intervention recommends the gluten free, casein free diet as well and suggests that parents incorporate it into their child's diet for at least 3 months. This means the items must be removed and there is no cheating. It can be challenging and children will resist at first but it can make a tremendous difference in the livelihood an autistic child lives. It may not be the cure for autism but it's certainly a step in the right direction and an option that every parent of an autistic child can try.